After finishing our African trip, the lure of Africa was too great. We enjoyed the Sahara Desert in Sudan so much that we decided to spend two months in Northern Africa visiting Tunisia, Libya and possibly southern Algeria. Kienny decided that she would stay home and look after Su-Lin, so I'm travelling with John Sandefur and Max and Sheila Newman. John is an old friend from the Territory (though he's been living in Melbourne for the past 10 years -- ugh!). Max and Sheila are friends from Sydney who travelled through Africa a few years ago. When Kienny, Su-Lin and I finished our African trip, we left Troopy in the UK. Max and Sheila flew over a fortnight ago and picked up Troopy. It was a great relief and pleasure when John and I landed in Milan, Italy two days ago to find Max and Sheila waiting for us with Troopy. For the last couple of days while we've been recovering from jetlag, we've driven along the Italian and French Riviera from Genoa to Nice. It's been a very pretty drive, with the mountains coming down to meet the lapping waves of the Mediterranean Sea, with villages and towns clinging to the mountains sides and along the narrow strip of land by what they call beaches... not to be compared with our Australian beaches! We especially enjoyed driving through Monte Carlo, with a diversion through one of the suburbs of the rich and famous! We had pleasant weather. It was a little cool, but no rain while travelling through the Italian and French Riviera on the way to Marseilles. As we could not find anywhere to camp in Marseilles, we headed down the coast to Cassis where we found a good campsite by the ocean. The following day we drove back to Marseilles and took the overnight ferry to Tunisia. The ferry we took was the Carthage, a new Tunisian ferry that goes between France, Italy and Tunisia. This was not a little boat. It carried 2260 passengers and 666 cars! It was totally staffed by Tunisians. The four of us shared a very comfortable cabin for the twenty two hour journey across the Mediterranean. We had three meals while on board, each in a different restaurant. The ship had a swimming pool and a spa, but we couldn't use it as the weather was not warm enough. We spent three hours trying to process our visa application only to find that for Australians this had to be done in port. On arrival in Tunis the next day, immigration and customs took a couple of hours although the procedures were relatively straightforward. It was a delight to drive out of the port and fill up the fuel tanks at African prices instead of exorbitant European prices. We spent three days in Tunis. Our first task was to go to the Libyan consulate to get our visa to enter Libya. The invite provided to us by Azar Tours was waiting for us at the Libyan consulate. This made the formalities of getting the visa go very smoothly and our visa was processed overnight. While in Tunis, Max and Sheila stayed at the Amilcar Hotel in Sidi Bou Said while we camped on a vacant block of land by the beach next to the hotel. Not only did we use Max and Sheila's shower, but they also lined their pockets each morning with eggs and toast from the restaurant for us! Sidi Bou Said is close to Carthage. 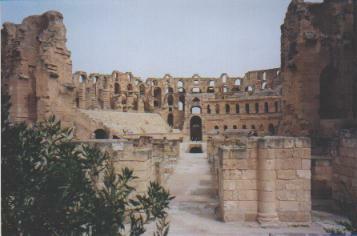 We drove through Carthage and had a glance at some the few remaining ruins, which was not very much at all. Incidentally, the Amilcar Hotel is named after the father of Hannabul, the Phoenician from Carthage who took his hundreds of elephants over the Alps in his attempt to defeat the Romans in Italy. On Monday we strolled through the souq or market of the Medina or old town area of the city with it's narrow cobblestone streets with covered archways and tiny recessed shops selling all sorts of everyday items to handicrafts for the tourists. On Tuesday we headed southeast towards Libya. The roads that we travelled on through Tunisia were very good. Much of the countryside was covered in Olive trees. Around Tunis the soil was very fertile with good rains, but the further south we went, it got drier and drier. As we approached the town of El Jem between Sousse and Sfax, rising before us in the middle of the road was a Roman Colosseum that is almost as big as the one in Rome! Built in 230AD, the Colosseum could hold 30,000 spectators. 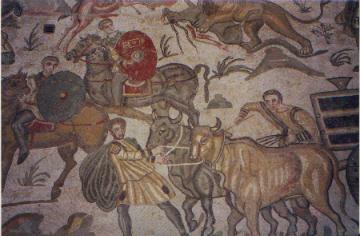 The ancient town of El Jem was the source of many of the mosaics housed in the Le Bardo museum in Tunis. Water for the ancient town was supplied through a 15 Km underground aqueduct. We camped the night in a camping ground amongst a stand of date palms in the town of Gabes. Tomorrow we head to into Libya. Taking the Ferry from Europe to Tunisia. There are three main routes from Europe to Tunisia. MotoEuropa has a good WEB page which covers most Mediterranean Ferries. In Tunis the CTN office, which is not far from the main Tourist Office in the centre of town, handles all three shipping lines. In France SNCM also handles CTN and Tirrenia bookings. In the UK Southern Ferries handles SNCM and CTN bookings. A Carnet-du-Passage is not required for Tunisia. European insurance companies can generally extent green card insurance to cover Tunisia. On arrival in Tunisia we were asked to show our Green Card Insurance. Chris Scott's "Sahara Overland - A route and planning guide" book is recommended. If you look closely you'll even see a few pictures of Troopy. 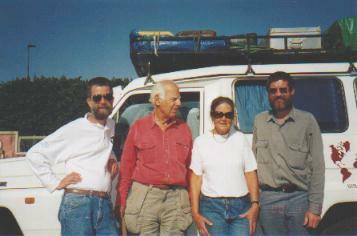 His Sahara Travel Information WEB page contains all the latest information for overland travellers.